How long will a pot last? While ageing is inevitable, it doesn’t mean that your pet can’t continue to enjoy a high quality of life into their senior years – they may just need a little help! Maintaining normal brain function is key to avoiding distressing behaviours caused by ageing and allowing our pets to continue leading their lives feeling alert and filled with vitality. Supplements can be costly and we can find ourselves with limited options so, just like the rest of our VioBrands ranges, we wanted our customers to have a trustworthy, more affordable product for their senior pets. When should I start giving RenewMe™? Our concentrated formula is rich in antioxidants which help to actively reduce the action of damaging free radicals. It also contains a complex of ingredients which are critical in promoting normal brain health and function, most importantly in neuron activity which carry messages within the brain. 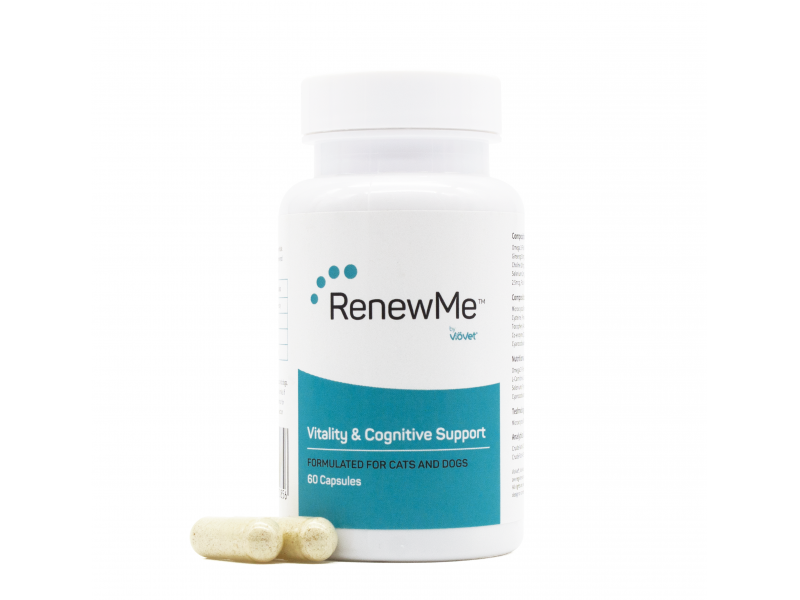 To get the most benefit, we recommend to start feeding RenewMe™ in your pet’s senior years to help inhibit the development of cognitive decline with age, or as soon as signs are first noticed. Can be opened and sprinkled directly into food or given whole. If your pet needs more than 1 capsule per day, we recommend dividing the amount between the morning and evening. Omega 3 Fish Oil Powder 100mg, N-Acetyl Cysteine 60mg, Panax Ginseng 50mg, Vitamin C 40mg, L-Carnitine 40mg, Vitamin E 30mg, Choline 20mg, Phosphatidylserine 10mg, Co-enzyme Q10 5mg, Vitamin B12 2.5mcg, Folic Acid 2.5mcg, Selenium 2mg, Vitamin B5 2mg, Vitamin B6 2mg. Crude Ash 6.1%, Crude, Fibre 0.2%, Crude Fat 4.5%, Crude Protein 9.4%. 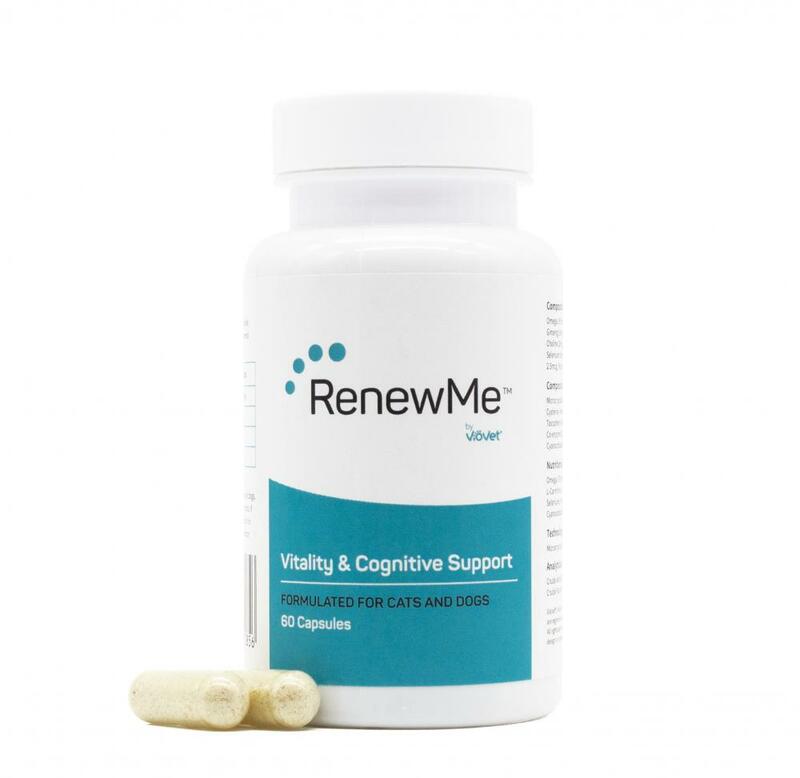 Below are some recent questions we've received regarding RenewMe™ Vitality & Cognitive Support Capsules for Cats & Dogs, including answers from our team. What is the size of the capsule? Compared to Activate Cat. Compared to Aktivait Cat, RenewMe™ has a larger capsule as pictured below, though this is because there is a much higher amount of active ingredients per capsule in RenewMe™ in comparison to Aktivait, so each capsule only needs to be given every other day, rather than daily. Can you advise what these capsules consist of? Each capsule contains: Omega 3 Fish Oil Powder 100mg, N-Acetyl Cysteine 60mg, Panax Ginseng 50mg, Vitamin C 40mg, L-Carnitine 40mg, Vitamin E 30mg, Choline 20mg, Phosphatidylserine 10mg, Co-enzyme Q10 5mg, Vitamin B12 2.5mcg, Folic Acid 2.5mcg, Selenium 2mg, Vitamin B5 2mg, Vitamin B6 2mg. Capsule casing: Gelatin (Though this does not need to be fed, the capsule can be opened and sprinkled into food).